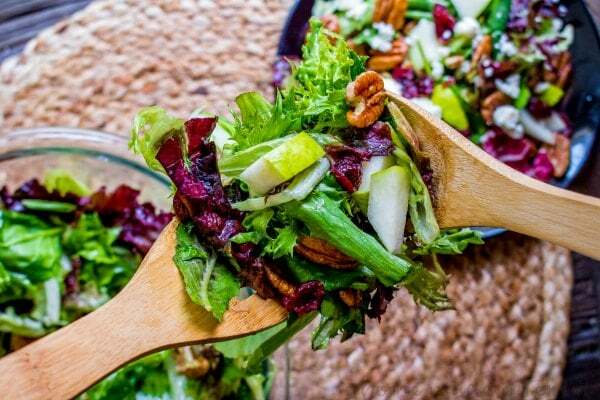 Winter Salad with Homemade Vinaigrette - Home. Made. Interest. 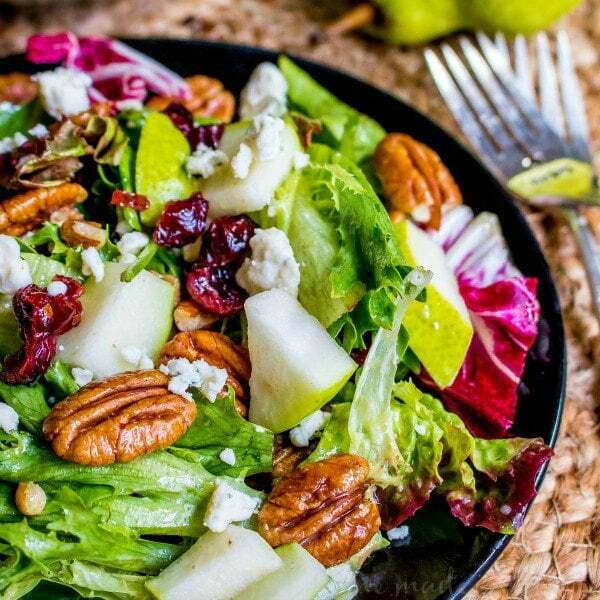 This easy Winter Salad recipe is full of winter fruits and nuts like pecans, pears, and cranberries, and topped with a homemade vinaigrette. Sides are tough for me to come up with in the winter. All summer long I use fresh tomatoes, squash, asparagus…and then the cold weather comes and I’m at a loss. I do love this Roasted Fall Vegetable Orzo and I make a really great Fall Coleslaw using crisp autumn apples but I still crave something light, and simple to throw together. The first time I made this Winter Salad I knew I had a winner. It’s overflowing with winter produce and it’s easy to change up with different nuts and cheeses so it never gets old. The first time I made this Winter Salad I was searching for an easy side dish for my annual Christmas party. I wanted something that was simple and could be served cold so I wouldn’t have to worry about finding time to bake anything else. My Christmas dinner party is usually 20+ people so a salad seemed like the perfect solution. 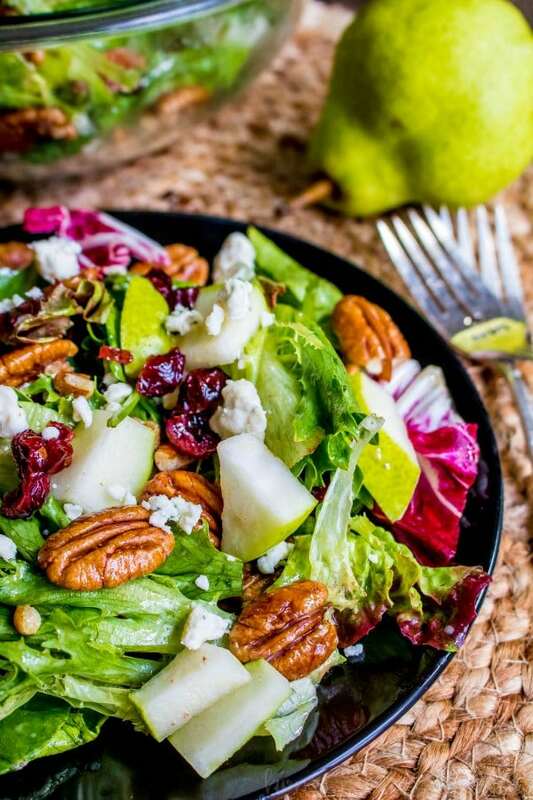 I looked at all sorts of Winter Salad recipes before I finally came up with my own using pears, pecans, dried cranberries, crumbled blue cheese, and a simple homemade vinaigrette. I threw everything together right before guests arrived and dressed it with the vinaigrette just before I served it. Every single bite of it was eaten and I think I got more compliments on it than anything else on the table! You can customize this Winter Salad in so many different ways so I’m just going to tell you my favorite way to make it. I start with pears because they are a delicious winter fruit that just about everyone likes. I usually buy Bosc or Anjou pears because they are slightly firmer and have a mild flavor. Next comes the dried cranberries because I love that little tart flavor they add to every bite, and for some crunch I like to add pecans. I don’t toast my pecans but you certainly could and I’m sure it would make the salad that much better. I think every salad needs some cheese so I sprinkle mine with crumbled blue cheese but you could also use feta cheese if you prefer. The vinaigrette is a simple mix of champagne vinegar, Dijon mustard, olive oil, and salt. You can add a little sugar too if you like it slightly sweeter but I love the vinegar taste so I usually skip that part. If you’re making this as a side dish for a holiday party make sure to toss the salad in the vinaigrette at the last minute to keep the salad looking fresh when you serve it. 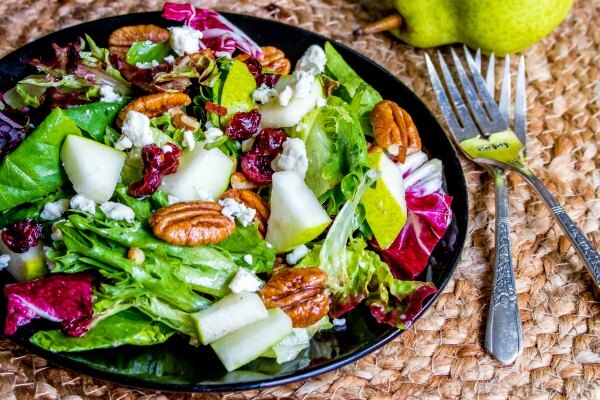 This light and crisp winter salad is full of seasonal fruits and nuts like pears, cranberries and pecans and topped with a homemade vinaigrette. That’s it. A simple Winter Salad recipe that is beautiful, delicious and really easy to make. It’s great for lunch, dinner, and parties all winter long! That winter salad is going to be hit at my dinner party on Friday. Thanks! Love this salad! Making it for the second Thanksgiving celebration this week. It was a huge hit at the first one, so why try another?!? I must admit that I added bacon. Bacon makes everything better 🙂 Have a very happy Thanksgiving! Do you think goat cheese would be a good substitute for the Bleu cheese if not all parties were a fan? Thanks. Going to try for this Christmas Eve. Yes!!! I’ll tell you a secret, I hate blue cheese so I always set some aside for me and put goat cheese on it instead. It’s delicious! Could I use apples instead of pears and feta instead of blue cheese??? You can definitely use apples and feta instead. I used apples and goat cheese in mine this year.